At Follycon, the British Science Fiction convention (Eastercon) held at Harrogate over the Easter weekend, I was one of the panel in a session discussing business for creatives. Our brief was to look at finance, publicity, marketing and branding for writers, artists and other creative workers when they start to make money and have to think of themselves as a business, for example when they get their first sale. It transpired that the people present were keen to hear about taxes and I said I would expand a little on my breathless summary of “three rules, two numbers and a concept”. Three rules: rule one – pay your taxes. As Oliver Wendell Holmes may have said, tax is the price we pay for civilisation, and I’d rather live in civilisation, thanks. Rule two – don’t take the piss. Much of the tax avoidance industry would disappear if this simple rule were more widely followed. For a creative start up, I’d suggest you don’t spend your time trying to argue you *really* started in business when you started thinking about unicorns in 1982 so you should be able to subtract your cinema tickets for the entire Star Wars and Marvel series from the £250 advance for your fantasy novel… It annoys HMRC and makes you look like a smart arse, and nobody loves a smart arse. Rule three – don’t let HMRC take the piss either. Know your rights and demand them. Remember the VAT MOSS fiasco and don’t assume you can’t make a difference. And don’t agree to let the state have your voiceprint on file! Next: two numbers to remember. The first is £1000, which is the amount you can earn under the new rules on tax free allowances for property and trading income. So if you are on PAYE and don’t have to make a self-assessment return already, you don’t have to panic about tax when you sign the contract for your first novel or sell your first illustration. Provided the advance is less than £1000 you don’t have to pay tax on it. If it is more than £1000 you can choose, instead of claiming every piece of paper and trip to Eastercon against it, to claim a flat-rate £1000 instead. Yep. If your advance is £1005 you can pay tax on the £5 – although be aware that this is a new piece of legislation, that’s just my interpretation of it, and HMRC haven’t produced particularly good guidance on it yet. If you are already on self-assessment for some other reason you don’t seem to get this option, for example. And – see Rule Two – you can’t decide you have thirty seven different income streams (selling books with red covers, selling books with blue covers…) and hope they’re all exempt. The £1000 is a global total, so it includes your book advance AND your side business of dog walking AND the £300 your cousin paid you for typing their thesis. The second number is, of course, £85,000 which is the point at which you have to start paying VAT. In general, if you suddenly start getting paid at that sort of rate I’d advise you to see an accountant anyway, but the reason the VAT limit is going to become increasingly important over the next few years is this thing called MTD – Making Tax Digital. HMRC has this theory that we’re all stashing cash down the back of our sofas and that if we all had to keep our records tidily on computers and share them with HMRC four times a year we’d stop doing it and they’d get more tax. What would actually happen, of course, is that we’d carry on being careful to declare our turnover – because, see Rule One and Rule Two – but we’d all be much more fly about our expenses, and that fifty quid train fare that you couldn’t remember whether it was business or personal would be much more meticulously recorded so profits might, perversely, go DOWN. If your turnover is less than £85k you can, at the moment, keep your records how you like. MTD cuts in at the VAT threshold – and, be warned, HMRC are taking “evidence” of whether the VAT threshold ought to come down. Watch this space. Finally, a concept: “wholly and exclusively”. You can deduct expenses which are “wholly and exclusively” for business purposes from your business turnover to arrive at your business profit. This is a big conceptual leap from PAYE taxes, where you can only deduct expenses which are “wholly exclusively and necessarily” incurred in the performance of the duties – a much more restrictive concept. So – I asked the audience – why are you at Eastercon? Wholly and exclusively for business purposes – to make contacts, to find an agent, publisher etc, to connect with your fans, to increase your professional reputation, to sell books or other creative work? Then the cost of the convention itself and the travel to and from it would be allowable expenses, incurred wholly and exclusively for business purposes. The fact that you might enjoy the convention doesn’t make it disallowable in and of itself: the test is why you came. The fact that you might not have found an agent/publisher/fan base at the con also doesn’t make the expense disallowable – you don’t have to be successful to have an allowable business expense. What you DO have to have is a wholly business expense. Can you claim the cost of food and drink at the con? That was when I referred people to the tax case of Mallalieu v Drummond. A barrister had to wear specific colours of clothes in court but wasn’t allowed to claim a deduction for them: you have to wear clothes anyway, so they weren’t “wholly and exclusively” for business purposes. We talked about the need to eat and drink anyway, and whether it would be reasonable to claim the extra cost of eating at the con. With strict adherence to Rule Two, you should be fine. Creatives, if you have a question, feel free to post it in comments or ask it on #taxtwitter. Tax mavens, if you’ve spotted anything I’ve forgotten or would like to add any other rules, numbers or precepts, please join in! Have I achieved Inner Peace? Hell no! The problem was that I had signed up for a personal tax account earlier in the year. I’d been deeply annoyed to find that, having done so, I could get details of my national insurance payments back to the 1970s but I couldn’t get into my tax returns. This apparently was because I had signed up to the self assessment service with different details. This was a baffling message to me (you only have one UTR, after all). …and then, after I had entered my return details and checked the tax calculation, I thought I would pay up. Yes, more yelling profanities at my computer screen, because what kind of evil genius designs a programme that works out how much you have to pay, takes three or four clicks to get you to the place that you actually pay, and then presents you with a blank “amount” field? I mean, carry the figure over from one screen to another, it’s not rocket science surely? I think the problem is simply that the reassuringly familiar architecture of the self assessment system is still there, but a shiny new “personal tax account” front page has been cobbled together onto the front of it. It works, just about, but it’s a cheapskate spatchcocked hotchpotch. I don’t want to do my tax return. I don’t want to do my tax return, because it’s boring, and difficult. I don’t want to do my tax return, because it’s boring, and difficult, and it’s important you don’t get it wrong. I don’t want to do my tax return, because it’s boring, and difficult, and important you don’t get it wrong, and it won’t make a blind bit of difference because I don’t owe them any money (or vice versa) anyway. I don’t want to do my tax return because it’s boring and difficult and important you don’t get it wrong, and it won’t make any difference, and they know it all anyway. I get a pension covered by PAYE, and I make less than the MTD threshold doing odds and ends of writing, and I get less than the dividend allowance on my non-ISA shares (actually, have I even got any non-ISA shares?) and less than the Personal Savings Allowance on my bank interest (actually, did the bank even pay me any interest?) and, honest go god, if they’d just take it and go away I’d happily pay the £100 fine not to have to fill in a tax return by the end of the month. But, honestly, every single thing that will be on my tax return is information already known to HMRC aside from my derisory three line accounts. Which is why I’m so interested in MTD. If it was a case of, “here’s your tax return, all you have to do is check over the figures, add your three line accounts and press send”, then it would be a boon for people like me. Here’s a nice quiet Christmas tax return task for you. 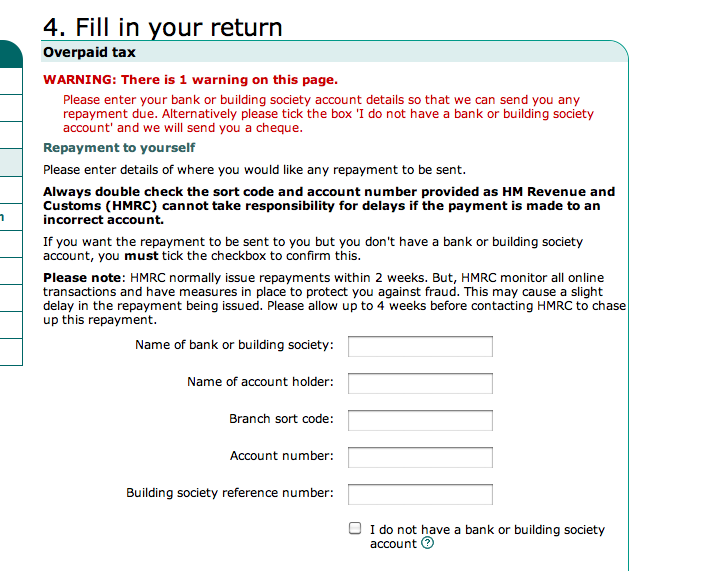 OK, so you’ve made sure you can log onto your HMRC account and fill in your online tax return. What you need to do next is to make sure you’ve got something to put on the return. Now, in an ideal world of course, you would go to the box file sitting next to your desk, the one marked “current tax”, open it up and find all your invoices, receipts and other necessary bits of paperwork, neatly filed in date order. In the real world, however, you’re looking for paperwork covering the period 6th April 2013 to 5th April 2014 and some of it may have… strayed? We’ll take searching for the bits you’ve put in another safe place as read, but for today let’s look at practicalities. What you need, is a diary. But what you probably DO have, in this internet age, is a Facebook account, and/or a blog, instagram, twitter or Linkdin. Here’s what you do. Get a big old notebook with twelve free pages (or twelve sheets of A4, or indeed a dozen brown envelopes). Start of by writing the relevant months on them, from April 2013 to March 2014. It will take you a good while, if you’re a regular FB-user, and will be an interesting exercise in itself, honest. Do the same with your twitter, instagram or other social media profile: look at what you were doing and when, and note down month by month what you were doing. Adorable baby pictures from that trip to Manchester? Remember how you called in to see your niece on your way back from the business trip to see that new client… write down the business trip – we’ll look for the details later. The point is to prepare as detailed a skeleton as possible of what you were doing in the tax year 2013-14. Once you’ve got the bones of it, we’ll tackle fleshing it out. But you have all of Christmas to reconstruct where you were in the 2013-14 tax year, and you’ll see all those amusing cat pictures again along the way. What are you waiting for? Go! My theory is that you should do your tax return in bite sized pieces, none of them taking more than the time it takes to drink two fingers of scotch. I would also like, just once in my life, to get my tax return in before January 31st! So walk with me as I complete my tax return, and think about getting on with yours. The first thing* – the absolute first thing – to do is to check you can still get into the HMRC website. Because you’re too late, now, to do a paper return, and it’s not December yet so there’s still time to get yourself registered with HMRC or get new passwords or whatever if you don’t have access. I went to gov.uk and followed the links to self assessment. And, lo! My computer automatically filled in my HMRC registration codes and I was online! Yay me! The system also has a built in security feature which tells you when you last logged on to it (presumably so that if it tells you that you logged on at four am you can investigate who has been impersonating you). When did I last log in? 31st January, of course! But I filled in the first page, and my tax return is 1% complete already and it isn’t even December yet. Two fingers of tax, two fingers of scotch. *unless you use an accountant, in which case the very first thing to do is speak to your accountant. Imagine all their clients pass them a carrier bag full of receipts on January 31st… If you haven’t given them all the necessary records yet, I suggest you have a conversation with them about what they’ll need from you if you want them to do your return this year. They may need more than two fingers of scotch from you – I recommend a bottle of Talisker at least! Look, I’m an ex-inspector of taxes. Of course I left my tax return to the last minute, and of course I finished up doing it on Saturday (the last possible day to avoid penalties) and of course I got stuck and had to ring the helpline. I mean, OK, it was five o’clock on the day the tax return was due, but I managed to get through to the helpline with no trouble. The trouble was that the helpline didn’t know where to enter an occupational pension either! The answer is, hit send (leaving all the boxes blank) and you will, eventually, get to the secret page 2 of part 4 which has a space for occupational pensions. Try a bit of signposting please! While we’re about it, where the hell do you get off with this page? Anyway. I finished my return, paid the tax, and sat back waiting for the Inner Peace to descend. Because, you know, when I worked on the CIS scheme, we were very proud of the groundbreaking way that the contractors’ monthly returns were pre-populated with the details of their subcontractors already known to HMRC. And, to be honest, the thing that took me longest in preparing my return, was trying to find the P60 with my pension details on it, which I clearly have put in the Proverbial Safe Place and no doubt it’ll turn up in time for me to make an amendment. But why am I struggling to find a piece of paper on which are written numbers that I’m going to type into a computer system so that someone in HMRC can check them against the information they already have? Is there any compliance risk from me putting the gross payments I received into my bank account, or last year’s figures, or an estimate of some other sort into my return, given that the tax has already been paid and there’s nothing that would tip me into another tax bracket? 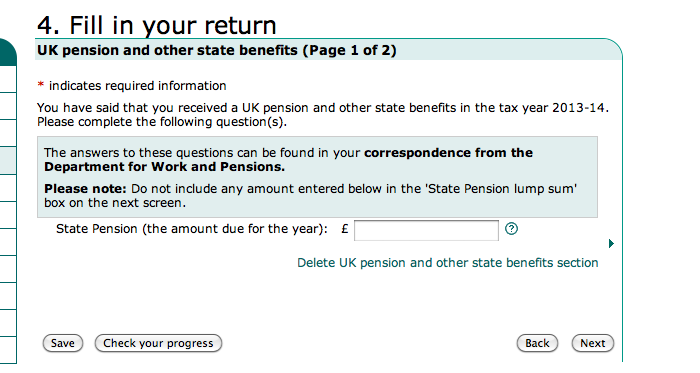 What I mean is: why isn’t my return pre-populated with the pension and other employment details that HMRC already knows? I suspect it’s because the HMRC computer isn’t one big shiny Skynet or Deep Thought but, like most large organisations’, it’s a patchwork of parts, a bundle of bits and bobs of hardware and software, tied together with goodwill and fingers crossed. To put the information HMRC already know about my pension into my actual return and feed it back to me would involve… spending more money than anyone has lying about. The old Inland Revenue was cutting edge with its computer technology, back in the seventies. Since then all the computer experts have been made redundant and privatised, so now the giant Aspire contract and the complicated web of suppliers and operators means no-one really knows how it all works. When the contract comes to an end wouldn’t it be nice to replace the outsourcing? I know, I know, that would count as an increase in Civil Service numbers and we can’t have that, can we? But it might cost less in the end. And I might not have to spend my January Saturday afternoons cursing a system that has to ask me to type in information that it already knows. You are currently browsing the archives for the two fingers of tax category.